Global Merchant Services is now offering to Retail and Mail Order Merchants Check Guarantee Services. Global Merchant Services Check Conversion/ Guarantee is an exclusive check guarantee service that has saved its customers millions of dollars in direct NSF, Stop Payment and Account Closed losses. Our system gives you access to check writing histories on millions of writers nationwide. 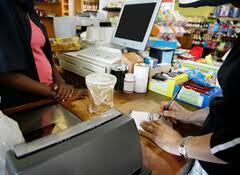 Global Merchant Services offers you check security when accepting a check that does not have to be a risk. When a customer walks in and offers to write a check, a quick inquiry into our system will give you all the information you need to make this a sound business decision. Global helps you increase sales by accepting checks. Americans write more than 167 million checks everyday, with checks accounting for over 30% of transactions, compared with 16% for Cash and 54% for Debit And Credit Cards. Again last year more checks were used to purchase products than ever before in history. Checks are almost used more than Debit and Credit Cards and continue to increase in popularity as the preferred form of payment by consumers. Competitive businesses always look for a way to safely accept the payment that the consumer is most prepared to offer. Our guarantee service is the safest way to accept checks from your customers. When using Global Merchant Services Check Conversion/ Guarantee consumers can be assured that checks are accepted in your place of business. You can accept checks with the assurance of there worth, cut NSF check losses and reduce the time and money spent on collections. Many clients are interested on how our guarantee process works; it is as easy as 1-2-3! You enter a customers information on any point of sale terminal or touch tone phone; the system gives you a quick and accurate response that guarantees the check. This means that, when properly approved, our agency accepts full responsibility for the payment of the check. Global Merchant Services will guarantee your customers check from any bank, savings and loan, or credit union in the United States and/or it’s territories. We believe in excellence, and our mission is to respond to your business needs.